For a young family in a new home, planning for growth is one of the key objectives for any garage renovation or home project. 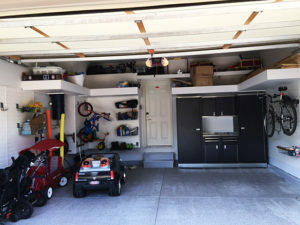 The large amount of overhead storage means that the family can grow their interests and past times with space to spare to store the related gear and equipment. With a slatwall storage system, there’s room to re-arrange hooks, baskets and shelves. Slatwall systems are ideal to optimize, expand and re-organize the usable storage space.